← Beware! Flip-flop summer control in cars! If you like to travel light and with only hand luggage, take a look at the following information we have compiled for you. Find at a glance sizes and measures allowed by the most popular airlines, and so you do not get a nasty surprise or have to buy a new suitcase! Well, as strange as it may seem, there is no generalized standard on the size and weight of the luggage allowed on board, so that the size allowed varies considerably according to the airline with which we fly. Is there the perfect suitcase that fits even the most restrictive requirements? Very difficult! The most fitting sizes are 55 x 40 x 20 or 55 x 35 x 25, but there are still sizes that do not fit. AEROFLOT accepts a carry-on luggage of the measures 55x40x20 cm, with a total weight of 10 kg, as well as an additional small bag. AIRBERLIN accepts hand luggage measures 55x40x23 cm, with a total weight of 8 kg, as well as an additional small bag. AIR EUROPA accepts carry-on luggage of measures 55x35x25 cm, with a total weight of 10 kg, as well as an additional small bag. AIR FRANCE accepts hand luggage measures 55x35x25 cm, with a total weight of 12 kg, as well as an additional small bag. BRITISH AIRWAYS accepts hand luggage measures 56x45x25 cm, with a total weight of 23 kg and also an additional small bag. 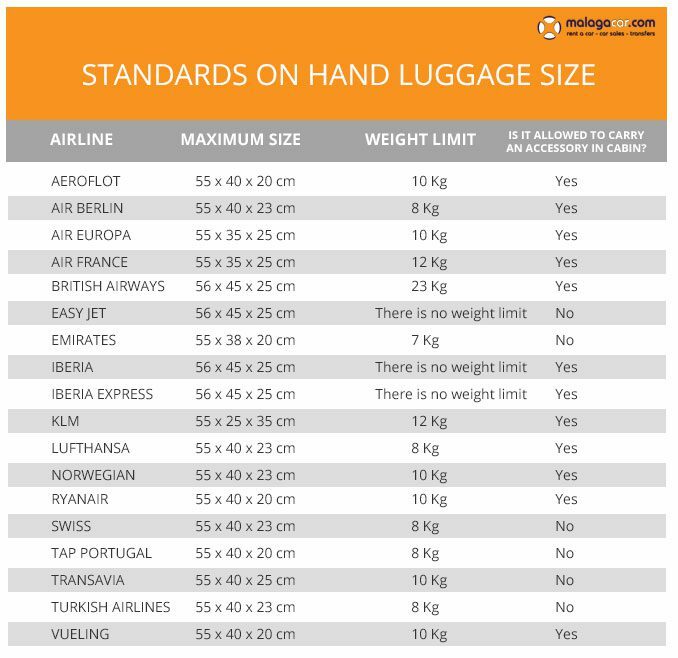 EASYJET accepts carry-on luggage measures 56x45x25 cm, with an unlimited total weight, but you cannot carry any additional bag. EMIRATES accepts hand luggage measures 55x38x20 cm, with a total weight of 7 kg. You cannot carry any extra bag. IBERIA accepts hand luggage measures 56x45x25 cm, with an unlimited total weight, as well as an additional small bag. KLM accepts carry-on luggage measures 55x35x25 cm, with a total weight of 12 kg, as well as an additional small bag. LUFTHANSA accepts hand luggage measures 55x40x23cm, with a total weight of 8 kg, as well as an additional small bag. NORWEGIAN accepts hand luggage measures 55x40x23cm, with a total weight of 10 kg, as well as an additional small bag. RYANAIR accepts carry-on luggage measures 55x40x23cm, with a total weight of 8 kg, as well as an additional small bag. Attention: From 1 November 2017 you can only carry a small bag or backpack. SWISS accepts hand luggage measures 55x40x23cm, with a total weight of 8 kg. You cannot carry any extra bag. TAP PORTUGAL accepts carry-on luggage measures 55x40x20cm, with a total weight of 8 kg. You cannot carry any extra bag. TRANSAVIA accepts hand luggage measures 55x40x25cm, with a total weight of 10 kg. You cannot carry any extra bag. TURKISH AIRLINES accepts carry-on luggage measures 55x40x23cm, with a total weight of 8 kg. You cannot carry any extra bag. VUELING accepts hand luggage of measures 55x40x20cm, with a total weight of 10 kg, as well as an additional small bag.